Just another day at Markham: defaced already? 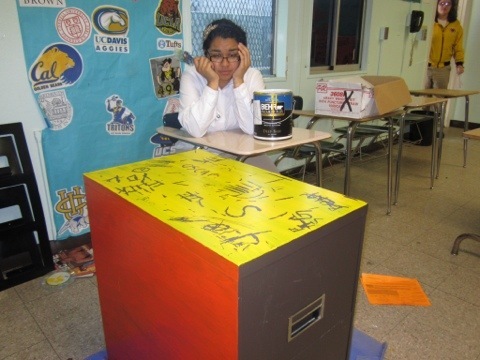 My teammate Jeanny decided to spruce up a filing cabinet by painting it bright colors. A day after she finished painting the top, we found this new, beautiful artwork. All these intricate designs were carved DURING A CLASS PERIOD. Looks like we can’t even leave something in a classroom for a day without it getting defaced. We’re painting a bunch of murals here next week for spring break (how ironic…). Let’s hope they can stay fresh and so clean.